All Yourfamily.Kitchen recipes have been tested, tried and approved by real families – from preparation methods down to the last bite. Our Bean Lasagna is a big hit with Mary (2,5 years) and her mum Susanna, founder of Yourfamily.Kitchen. What is your family’s favorite recipe? We’d love to know what works well for your family. Share your feedback by leaving a message below, or connecting with us on Facebook and Google+. We value your feedback, and are always open to new ideas that rock kids and parents. 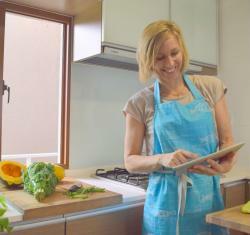 Susanna is the founder of Yourfamily.Kitchen and mother of two girls, aged two and five. Hardest thing about feeding the family for her used to be finding recipes that were nutritious and tasty – yet uncomplicated to make. Can you bake the haze away?